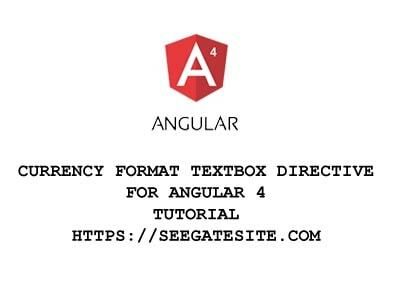 Angular 4 tutorial how to create currency directive. Lately, I am studying about angular 4 because there is an ERP project in the company where I work. Creating a currency formatter on the angular is different from the JQuery I’ve discussed in the How to Create Jquery Plugin for Input Currency article. But if you’re used to Angular 4, making currency directive is pretty easy, and the use is more efficient than jquery. Consider the following tutorial. Before starting the main topic, I will discuss a bit about what is directive and why we need a pipe? An angular directive is a function executed by Angular when Angular finds Directive in DOM (Document Object Model), the function can almost do everything like hiding element before the page loaded, repeat, execute an expression, etc. There are two types of directive: built-in directive and custom directive. To create this angular directive in the text field, we need a custom directive. The pipes are similar to Filters in AngularJs (Angular 1). The pipe is used to format output on HTML templates. Angular 4 also provides built-in pipe such as uppercase, lowercase, currency, Datepipe. In this tutorial, we will create a custom pipe so that the currency format can run well. Thus my article about create angular directive to format currency, hope useful. Sigit, the directive doesn’t seem to work if there is a default value in the input text element. By adding [(ngModel)]=”someValue”. If someValue is set in the constructor as this.someValue = 55.8. The expected result should be Rp. 55.80. Is there a way to fix this? I am trying to apply my directive on two binded value using [(ngModel)] and i do not want the value to get carry forwarded to backend. Is there a way to do so while applying this custom directive? hello Dan, after i check, i try it using formgroup its running well. I followed all your steps getting the below error.. can you please let me know how to fix this error? NullInjectorError: No provider for MycurrencyPipe!